Diana Thater is known for creating works of art that re-define the physical, and conceptual boundaries of how moving images are experienced. 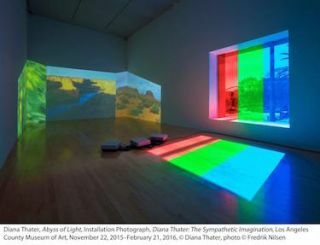 So it’s fitting that the artist’s latest exhibit, “The Sympathetic Imagination,” uses Sony laser projectors, since that technology was designed for the same purpose. ‘The Sympathetic Imagination’ exhibit ends its run in April at the Los Angeles County Museum of Art (LACMA) and is a prime example of video art meeting video technology. The exhibit uses 35 Sony projectors a combination of laser models (VPL-FHZ700L and FHZ55) and lamp-based units VPLFX30 models). Based on the visitor response and the feedback from the museum¹s team, the two mediums were the right fit. According to Kim, “The Sympathetic Imagination” is the most comprehensive exhibition of her art to date, giving visitors an opportunity to see an important selection of her film, video, and installation-based works. To convey these themes in the best setting possible, LACMA searched for the right physical space (since this is the largest exhibition dedicated to a female artist in LACMA's history) and the right technology. The LACMA team identified several specific technology requirements to match the exhibit’s unique aspects. LACMA’s approach to new technology is to understand, from a curatorial perspective, the context and expertise employed in an artist’s work. The choice of Sony projection was based on the exhibit’s objectives, and Heilman and his team found it helpful to be able to choose from a range of technology types. Lens selection and quality were also essential criteria in determining how the team would use technology for this show, since Thater’s works marry technology to architecture in ways that can require very exact and/or extreme throws. Additionally, beyond initial tech requirements and installation, it was important that the equipment be durable and user-friendly, since the exhibit will tour to other institutions with other gallery installation teams. To make “The Sympathetic Imagination” really come to life, the LACMA team put the edge-blending feature of the Sony projectors to the test. Edge blending is the technique of taking multiple images and "weaving" them together to create one large image, especially useful in challenging lighting environments. The LACMA team also used Sony's FWD-46B2 monitors for Thater’s single- and multi-channel flat panel display based video works.